The cookies, baked by Lauren Bolt, Executive Pastry Chef at Jenner’s Pond Retirement Community, were presented to the Chester County Sheriff’s Office to show that their law enforcement service is appreciated and valued. 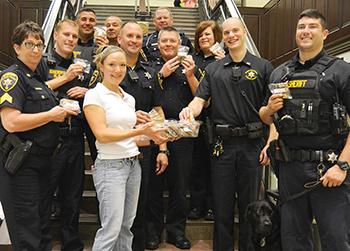 Chester County’s K-9 deputies were included in the delivery, each receiving specially baked dog biscuits. “Cookies for a Cop” is a nationally organized gesture of sweet kindness for local law enforcement personnel. The program, now in its third year, delivers hundreds of thousands of cookies to law enforcement departments, correctional centers and dispatch centers in states across the nation. Photo caption: Lauren Bolt, executive pastry chef at Jenner’s Pond Retirement Community, delivers freshly baked cookies to members of the Chester County Sheriff’s Department.